One of the problems with the history of cocktails, is that the people most qualified to write it would rather be drinking. Those that are writing, tend to be prone to indulging in a bit of self aggrandizement. Case in point, one Harry Johnson. 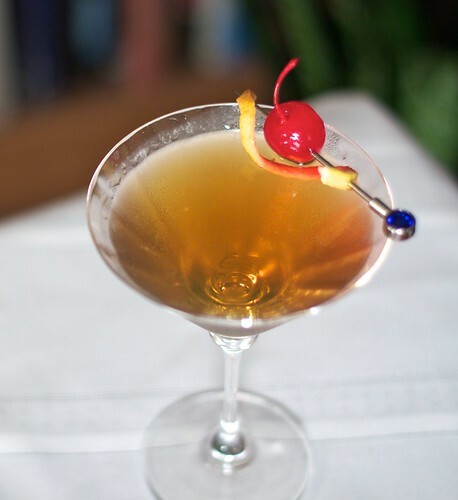 According to cocktail historian David Wondrich in his book Imbibe, Johnson’s many unsubstantiated claims include publishing the first cocktail book in 1860 (none of which exist today in spite of his claim of selling 10,000 copies) and being the first to bring cocktails to New York. Interestingly, however, the 1900 edition of his book does included the first recipe fora cocktail called the Bijou. The 1895 edition of C.F. Lawlor’s The Mixologist contains a recipe for a cocktail of the same name but substituting Grand Marnier for green Chartreuse (to much less effect according to Wondrich). Interestingly, Harry Craddock’s Savoy Cocktail Book (ca. 1930) has an essentially identical cocktail called the Jewel (I guess the English didn’t like the French name). Stir with ice and strain into a chilled cocktail glass and garnish with a twist of orange and a cherry. This really is an interesting little tipple. The herbal complexity of all three liquors, especially the green Chartreuse, really seem to harmonize well.